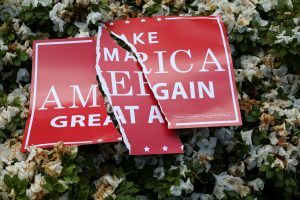 Americans broadly believe their country’s political tone has become less civil since Donald Trump was elected president and that fundamental rights are weakening, according to a new PBS NewsHour/NPR/Marist poll. 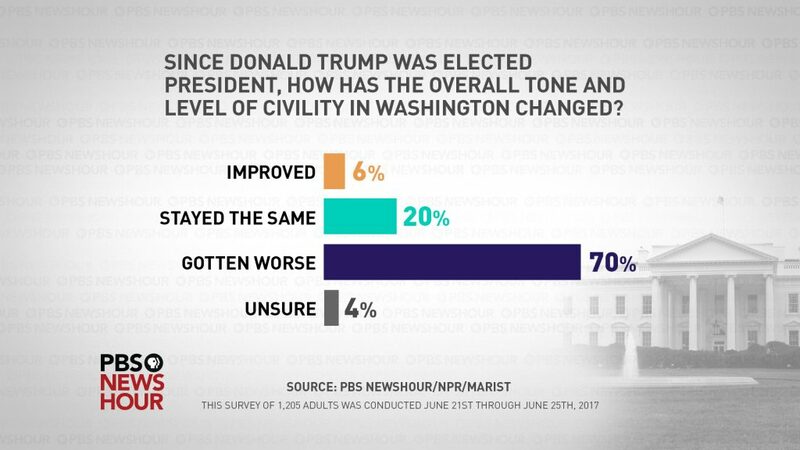 Seventy percent of Americans think political civility has worsened since Trump was elected president, according to the poll. That holds true regardless of party, and it marks a substantial increase since a July 2009 Gallup poll showed that just a third of U.S. adults said the nation’s political tone and civility were worse since former President Barack Obama took office. Trust in Congress and the media is low, while trust in the intelligence community and the courts is high, according to the poll. Americans — 60 percent — said they trust the intelligence community and courts the most and Congress and the media the least. Trust in Congress and the media is low, while trust in the intelligence community and courts is high, according to the poll. Overall, 61 percent of Americans said they do not place much trust in the Trump administration. Seventy percent of people who identify as political independents said they do not trust the Trump administration, along with 90 percent of Democrats. Among Republicans, 84 percent of respondents said they trust the president and his administration. And despite the controversies surrounding the White House, the overall numbers remain virtually unchanged since March, according to Marist polling data. Meanwhile, as Republicans in both the House and the Senate struggle to pass a bill on health care, only six percent of Americans say they have a great deal of trust in Congress, and another 23 percent said they hold a “good amount” of trust in the legislative branch. That response held regardless of political party and remains largely unchanged since March when a quarter of Americans — 27 percent — said they placed at least a good amount of trust in Congress. Delving deeper into the traditional American values, 52 percent of Americans said the nation should preserve the right to protest and criticize the government. But just 41 percent of Republicans think the right to protest should be scaled back, while only seven percent of Democrats and 11 percent of people who identify as independents said they feel the same way. 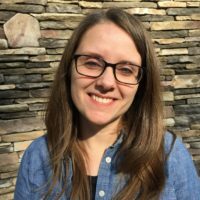 Overall, half of U.S. adults said freedom of religion in this country is just fine as it is, while an additional third of Americans said the United States now restricts this right too greatly, and one-tenth of all respondents said the country needs to do more to rein in this freedom, something Republicans were more likely to say than Democrats or Independents, according to the survey. And when asked about the right to vote, six out of 10 Americans overall think the United States needs to change nothing. But among Republicans, a quarter of respondents think the U.S. has gone too far in expanding that right, far more than five percent of Democrats and eight percent of people who are politically independent. And half of U.S. adults said they have at least a good amount of trust that the nation’s elections are fair. Of those, 17 percent of Americans said they trust elections “a great deal.” Nearly as many respondents — 18 percent — said they don’t trust elections at all. Only six percent of Republicans said they had no trust at the ballot box, compared to 19 percent of Democrats and 20 percent of Independents who said they felt the same. Surely, Americans can agree on their own history, right? The data may surprise (or sadden) you. Three-quarters of U.S. adults say their nation declared independence from Great Britain, but 23 percent guessed a different country — 13 different countries to be exact, including Mexico, Russia, Brazil and Afghanistan. And seven out of 10 Americans correctly said that happened in 1776, an improvement compared to six out of 10 respondents in 2011, according to Marist polling data. 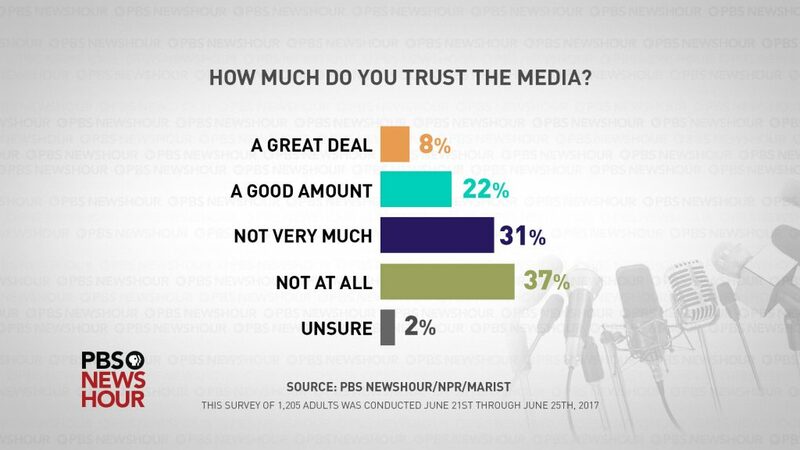 The PBS NewsHour/ NPR/ Marist College Institute for Public Opinion poll contacted 1,205 U.S. adults using landline and mobile phones between June 21 and June 25. There is a 2.8 percent margin of error.